I wish you a happy Monday morning and a good start into this new week! Today’s story’s about one of the best drummers of the world, Jeff Porcaro. Jeffrey Thomas Porcaro (April 1, 1954 – August 5, 1992) was an American drummer, songwriter, and record producer. In a career that spanned more than 20 years, Porcaro was best known for his work with the rock band Toto. Porcaro is one of the most recorded session musicians in history, working on hundreds of albums and thousands of sessions. While already an established studio player in the 1970s, he came to prominence in the United States as the drummer on the Steely Dan album Katy Lied. 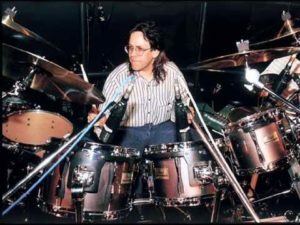 AllMusic has characterized him as “arguably the most highly regarded studio drummer in rock from the mid-’70s to the early ’90s”, further stating that “It is no exaggeration to say that the sound of mainstream pop/rock drumming in the 1980s was, to a large extent, the sound of Jeff Porcaro.” He was posthumously inducted into the Modern Drummer Hall of Fame in 1993. Porcaro began playing drums at the age of seven. Lessons came from his father Joe Porcaro, followed by further studies with Bob Zimmitti and Richie Lepore. When he was seventeen, Porcaro got his first professional gig playing in Sonny & Cher‘s touring band. He later called Jim Keltner and Jim Gordon his idols at that time. During his 20s, he played on hundreds of albums, including several for Steely Dan. He toured with Boz Scaggs before co-founding Toto with his brother Steve and childhood friends Steve Lukather and David Paich. Jeff Porcaro is renowned among drummers for the drum pattern he used on the Grammy Award winning Toto song “Rosanna“, from the album Toto IV. The drum pattern called the Half-Time Shuffle Groove, was originally created by the legendary drummer Bernard Purdie who called it the “Purdie Shuffle.” Porcaro created his own version of this groove by blending the aforementioned shuffle with John Bonham’s groove heard in the Led Zeppelin song “Fool in the Rain“. Porcaro describes this groove in detail on a Star Licks video (now DVD) he created shortly after “Rosanna” became popular. Frank Zappa, Miles Davis, Bruce Springsteen, Elton John, Larry Carlton, Michael McDonald, Seals and Crofts, and David Gilmour. Porcaro had contributed drums to four tracks on Michael Jackson’s Thriller, as well as played on the Dangerous album hit “Heal the World“. He also played on 10cc‘s …Meanwhile (1992). On the 1993 10cc Alive album, recorded after his death, the band dedicated “The Night That the Stars Didn’t Show” to him. The bonus track of today’s Toto’s “Africa”. I wish you a successful Monday and come back very soon with the next story.